Pentagon Jr. is one of the biggest stars in the indie scene, most notably as Impact Wrestling’s champion. 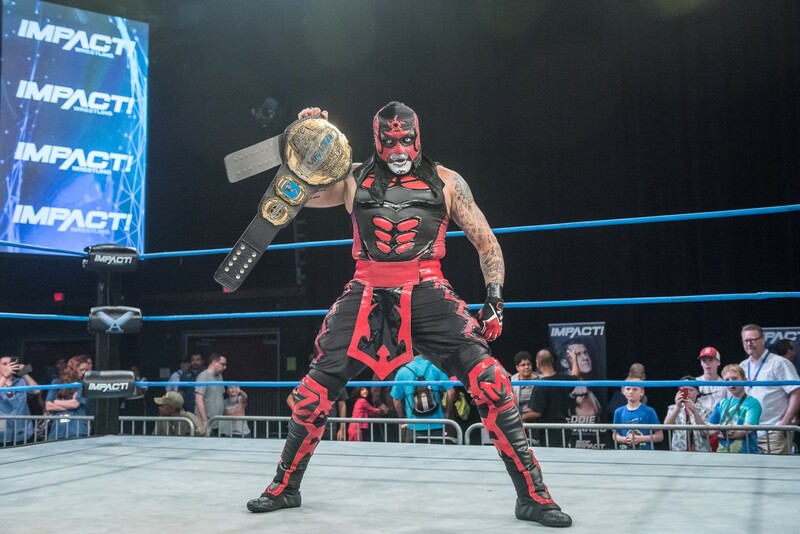 Impact Wrestling made headlines when Pentagon Jr. departed its last pay per view with the world title. Pentagon dethroned Austin Aries in a triple threat match that also featured Rey Fenix at Redemption on April 22 after hitting an arm-breaker on Aries, then finishing him with his patented Pentagon Driver. “I am very, very happy to win the Impact title,” said Pentagon. “Austin Aries is an innovator, he’s very strong, and he demonstrates how to act as a champion. Rey Fenix is, to me, the best high-flyer in wrestling. It’s an honor to be in the ring with him. It’s harder to beat someone like Fenix because he knows me so well. Sometimes, he knows my moves before I even think of them, and I know him very well, so it is very difficult for us to beat one another. The bloodthirsty 33-year-old is relentless in his pursuit of pain in the ring, and his style has elicited genuine interest from wrestling fans across North America. Outsiders constantly deride the phoniness of pro wrestling, but Pentagon’s roots in the business are very real. A traditional luchador in the sense that he is unwilling to share his identity or take off his mask in public, the star from Mexico has captivated audiences in AAA, Lucha Underground, and independent promotions throughout the world. In addition to his status as Impact champ, he is also currently champion in Lucha Underground and California-based PCW Ultra, as well as a major piece of Court Bauer’s Major League Wrestling, star-studded indie PWG, AAW out of Illinois, and Mexican-based promotion The Crash. He offers a uniquely compelling style that is not currently found in WWE. Pentagon may be the first Mexican wrestler more famous outside of Mexico than in the country, and he has a presence unlike any other star–luchador, cruiserweight, or heavyweight–in the way he compels fear from the audience. Despite a reputation built on intimidation and pandemonium, Pentagon showed a far more human side to his character when he spoke over the phone with Sports Illustrated before his match in Tijuana this past weekend with The Crash. Pentagon shifted between English and Spanish throughout the interview, even making sense of this reporter’s attempt at asking questions in his native tongue. One of Pentagon’s strengths is his ambition, which he helps draw from three of his strongest influences: Konnan, Rey Mysterio, and Alberto El Patron, who wrestled in WWE as Alberto Del Rio. As Impact builds toward a May 31 rematch between Pentagon and Austin Aries on Pop TV, Pentagon is well-aware of his standing in the company, Impact’s history, and its former champions. He is humbled to represent the same company that saw the likes of Sting, Kurt Angle, and AJ Styles all wear the world title. One of Mexico’s brightest stars, Pentagon is quickly attaining a worldwide presence in pro wrestling. He is also a part of the upcoming All In show this September, and paid close attention as the show sold a reported 10,000 tickets in under 30 minutes. Pentagon is dark, dangerous, and insane in the ring, proudly proclaiming he has zero fear, and parallels can be drawn to his favorite wrestlers as a child. Anoche se dieron con todo @PENTAELZEROM y Carístico. Al término de la lucha, el Cero Miedo amenazó con buscar al Seminarista en su casa, la Arena México. As Pentagon continues to attain wrestling notoriety, he admitted that his goal—even more than the gore and the titles—is to become known across the wrestling world. WWE’s PG rating has finally paid dividends: the wrestling juggernaut is widely reported to have reached a five-year, $1 billion deal with Fox to air SmackDown Live. There is a reason that WWE markets to children and families, and it is evident in the company’s monumental move to Fox. A Friday night timeslot is not ideal for a core audience of 18-to-35-year-olds, but it fits perfectly for younger viewers. The shift of SmackDown to Friday, which is expected to occur in October 2019, allows WWE a later night in the week to promote their pay per views and Network specials. The current schedule, with Tuesday being its last weeknight of cable programming, leaves the company slightly hamstrung when it comes to promoting events on Sundays. WWE will also bring content and viewers to Fox on Fridays, making it a perfect marriage for the two. How does this affect wrestling fans? For starters, a heavy dose of pay per view caliber matches will be expected to air on Fox to deliver significant ratings. Also, the brand split cannot last if the new television contracts are held by different broadcasters. If NBC Universal and Fox win the rights, respectively, for Raw and SmackDown, both networks will want full access to the roster. But bear in mind: WWE’s financial state directly impacts its programming. And if you are a wrestling fan, odds are high that you have critiqued WWE programming recently. Wasn’t WrestleMania 34 three hours too long? Shouldn’t Roman Reigns finally be turned heel? Does Ronda Rousey deserve her title shot at Money in the Bank against Raw women’s champion Nia Jax? And where does the “Lashley Sisters” segment from Raw rank in the all-time worst skits in WWE programming history? Vince McMahon may hear these complaints, but he does not need to listen. WWE stock just surpassed $50 a share last week, closing at a 15 percent jump this past Thursday. How do you tell McMahon that he is doing something wrong? Until the ratings plummet or the television deal goes awry, McMahon will not change the current style of the product. • Ronda Rousey will not have Triple H selling and bumping for her like she did at WrestleMania, but expect her Raw women’s title match against Nia Jax at Money in the Bank to be dynamic. Wrestling is a business that takes two, but Rousey’s ability to work a compelling style will leave viewers amazed after the June 17 show in Rosemont, Illinois. She is being placed in this spot for a reason; not because she has earned the right in pro wrestling, but because her in-ring work makes her one of the most captivating wrestlers in the world. Outside of Charlotte, who is more talented in the ring, Rousey has no peers, and a large part of that is the fact that she is not overexposed like the vast majority of the WWE roster. Also, the main events on Raw and SmackDown, which saw Braun Strowman defeat Finn Balor on Raw and then Daniel Bryan tap out Jeff Hardy on SmackDown, highlighted how WWE’s programming should be built around its wrestling. • Beyond Wrestling returns to live action this weekend, with a “Solid Gold” show on Saturday at the Varnum Memorial Armory in East Greenwich, Rhode Island, and then on Sunday at Electric Haze in Worcester, Massachusetts, for an aptly named “All Day” show that begins at 2pm and continues into the evening with a Women’s Wrestling Revolution show at 6pm. A match that stands out on Saturday is a tag team encounter pitting Ringkampf vs. EYFBO. Ringkampf features two stars-in-the-making in former EVOLVE champion Timothy Thatcher and Austrian beast WALTER, who were both backstage at NXT TakeOver: New Orleans this past WrestleMania weekend. EYFBO are the highly talented Mike Draztik and Angel Ortiz, who are two-time Impact tag champs as the Latin American Xchange in Impact Wrestling and go by, respectively, Santana and Ortiz. Draztik and Ortiz are native New Yorkers, having first met in backyard wrestling circles in NYC. They relish the chance to perform throughout the indies as EYFBO, which stands for Entertaining Your F------ Balls Off, as well as in Impact as LAX. The match has added significance as Thatcher and WALTER are rumored to be headed to NXT, while Draztik and Ortiz have helped give meaning to the Impact tag titles over the past year. This encounter, which happened once before this past October in Germany, stands as a chance to highlight indie wrestling while showing off the best at the craft of tag team wrestling. Ortiz touched on the qualities that make Thatcher and WALTER such a dynamic match-up. Draztik and Ortiz have only scratched the surface of what they can accomplish in Impact, and they plan on making their pursuit of a third title run even more memorable than the first two reigns. Before the Beyond match against Thatcher and WALTER this weekend, LAX can be viewed on Pop TV this Thursday against the Cult of Lee’s Trevor Lee and Caleb Konley. • Wrestlers looking to make something of themselves in the difficult business of professional wrestling would be well-served to look at the recent accomplishment of Ring of Honor’s Cheeseburger. Cheeseburger just wrapped up his seventh and final year on the ROH ring crew, which included some long and hard nights when he had to rush into his gear to wrestle and other nights when he was not on the card but waited for the show to end to break down. Cheeseburger is in the middle of a feud with Bully Ray, who is WWE Hall of Famer Bubba Ray Dudley. The former ECW icon has taken some liberties—and low blows—in the ring against the beloved ’Burger. “He is someone I looked up to as a mentor, he’s a legend,” said Cheeseburger. “But he obviously looked at me as someone who doesn’t belong in this industry. I’m looking to change that. Cheeseburger started training in October of 2010 and is rapidly approaching his 8-year anniversary with ROH. Despite the experience, the matchup with Bully is not a favorable one. “I need the crowd to help beat him,” said Cheeseburger. “If they’re behind me, I’ll use their energy to keep going after him and get the victory. Cheeseburger’s authentic nature is an integral part of his success, and he is grateful for continued support from his fan base. • The Dungeon of Doom is coming to Boston. The Barbarian and Haku will be appearing with “The Taskmaster” Kevin Sullivan, along with WWE Hall of Famer Teddy Long, for a signing this Sunday at Sportsworld in Saugus, Massachusetts. The meeting is a reunion for the Barbarian and Haku, who have known each other for the past 53 years and grew up in nearby Tongan villages in Nuku’alofa. The Barbarian and Haku teamed together in the WWF, even opening WrestleMania VII against the Rockers in 1991. The duo also had a lengthy run together in WCW under Sullivan’s managerial helm as the Faces of Fear. Barbarian believed that Haku was a real-life Samurai in the way he presented himself in and out of the ring. The humble Haku is not entirely ready to admit that he was once the most feared man in wrestling. As for the unfortunate souls who have criticized Haku’s chosen profession and derided pro wrestling as fake, the proud native of Tonga always stood his ground to protect the business that fed his family. Haku even had a run as WWE tag team champion in the Colossal Connection with Andre the Giant. A year later, Vince McMahon entertained the idea of feuding Andre with Earthquake. But Haku confirmed that there were no plans, presumably due to Andre’s health, to ever wrestle each other after their WrestleMania VI split following an extremely compelling loss to Demolition in what remains one of Andre’s most enduring moments that saw Haku shoulder the work load yet still allowed a limited Giant to have a memorable face turn. Haku and Barbarian still work indies and make appearances, and Haku will be appearing at the upcoming PCW Ultra show on June 8 with UFC Hall of Famer Stephan Bonnar. Barbarian noted he misses the old camaraderie of the locker rooms where he spent the vast majority of his adult life. One man both Barbarian and Haku grew close with was the late Bobby “The Brain” Heenan, who managed both men. Haku’s time with Heenan dates back to the late 1970s and he even worked as one-half of the Islanders in the WWF as Heenan with his manager starting in 1986. • On the subject of Boston, the Red Sox will be having a “WWE Night” on July 11 that features a bobblehead of second baseman Dustin Pedroia with a WWE title wrapped around his shoulder. Pedroia, a two-time World Series winner and former MVP, is a big fan of the “Nature Boy” Ric Flair and has hosted Flair in the Sox clubhouse. “With WWE, the biggest issue was the weekly travel for SmackDown,” said Ranallo. “I also had a job with Showtime Championship Boxing, and now Bellator MMA, so I was busy almost every weekend and the fact that I had to be on the road with SmackDown Live, which was a dream job in live TV on the USA Network, was going to kill me. Literally. My close friends saw how it was affecting me, and it just came to a head. The Q&A will run in full this Friday. • Something to Wrestle with Bruce Prichard and co-host Conrad Thompson returns this Friday at noon ET with a new podcast, with a “Love to Know” episode covering a myriad of topics. The questions will be drawn from social media, and Thompson is excited to share some new information with his audience. Thompson’s “83 Weeks with Eric Bischoff” detailed the highly controversial Bash at the Beach from 2000, which was Hulk Hogan’s final appearance with WCW as well as Booker T’s first-ever world title win with the company during the Vince Russo-Bischoff era. Only two years earlier, in 1998, WCW was considered the premiere wrestling company in the world. “Something Else to Wrestle with Bruce Prichard” on the WWE Network keeps that synergy alive, examining Vince Russo’s creative run in WWE. Russo had success in WWE, helping the company reach new heights in ratings on Raw. Addiction is crippling, so a sincere congratulation is in order for such a fantastic accomplishment. I also enjoyed how Dustin Rhodes was dressed as Goldust in the photo, which is the character that helped lead to his highest success and most difficult falls. If you have the chance, read some of the replies. Dwayne “The Rock” Johnson, Brian “The Road Dogg” James, and Cedric Alexander are just a handful of past and present wrestling stars that reach out with some kind words.